This color totally freaked my camera out! I think my poor Canon just didn't know where to focus. 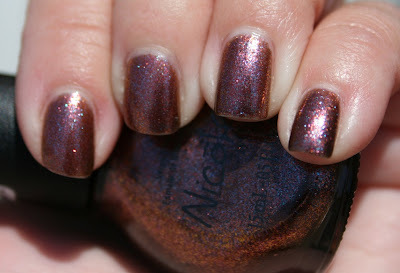 It's absolutely gorgeous, and the neatest color I've ever seen from Nicole. I knew when I saw Scrangie's swatches that I needed this one. 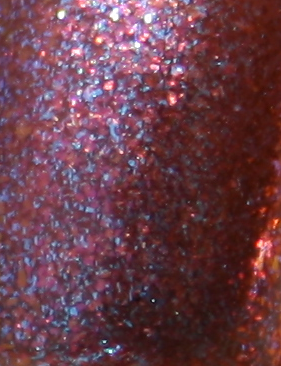 It's bronze-based and has blue and red shimmer. I have no idea why they put "Mauve" in the name..... mysterious! Collection: Just Busta Mauve is part of the Nicole by OPI Target Exclusive Collection for Fall 2012, released in late Summer 2012, along with For Gold Times Sake, If the Blue Fits...., Iris My Case, and Mer-made for Each Other. I saw this at Target this past weekend and almost bought it! It's so pretty.